With four songs from the original, Jon Favreau’s Lion King remake is guaranteed to have a great soundtrack. 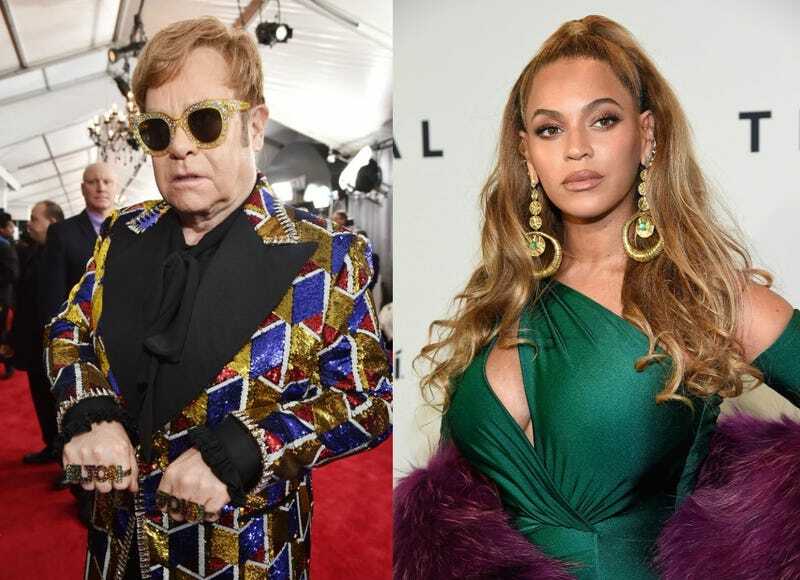 But that’s not enough for perfectionists like Elton John and Beyoncé, who are reportedly working on an original song to close out the 2019 film. Reports of the two musical icons heading into the recording studio have cropped up since last November, when Beyoncé was first confirmed to voice the character of Nala. But now Elton John tells The London Sun that he and his fellow multi-hyphenate are collaborating with legendary lyricist Tim Rice on a new end credits song for the film, which has Donald Glover voicing Simba: “And then there will be an end, closing song, and we’ve been speaking to Beyonce’s people and hopefully Tim and I and her can cook up something. James Earl Jones will be back to voice Mufasa, while Chiwetel Ejiofor has taken over for Jeremy Irons in the role of Scar. And, as previously noted, John Oliver has been perfectly cast as the fussy Zazu. The Lion King takes the throne July 19, 2019.